It’s summer time and everything is ripe and ready for picking. Time to get out the canner and jars and lids and start putting up some yummy relish and jams using gluten free recipes. I’ve been canning all weekend. Decided to make some sweet pickle relish, peach and raspberry jam and strawberry fig jam. I will get the recipes up soon. I wanted to introduce you to my faithful helper who follows me wherever I go no matter what I am up to. This is Roy following me into the garden. 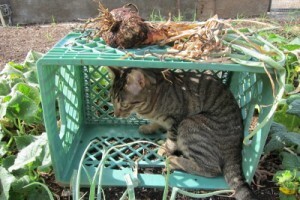 Now here he is trying to help me pick vegetables. Wait until you see how he helped me when I was making my sweet pickle relish. Ps.. go have some fun with your own helpers this week.